SpaceX founder, CEO and Chief Designer Elon Musk says the company’s production schedule is too tight to support a test flight of the Falcon Heavy in 2014. 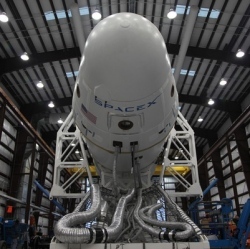 With plans to compete with ULA for launches of heavier payloads, SpaceX is also preparing to test and qualify the new Falcon Heavy launch vehicle in 2015. SpaceX says its Falcon 9 v1.1 medium-class launcher is expected to receive U.S. Air Force approval this year to compete against United Launch Alliance (ULA) Atlas 5 and Delta 4 rockets for launches of sensitive national security payloads. SpaceX President Gwynne Shotwell says Falcon 9 certification is expected this year, "in time to compete for the first round" of Air Force contracts to be awarded in 2014 under the service’s Evolved, Expendable Launch Vehicle (EELV) program.